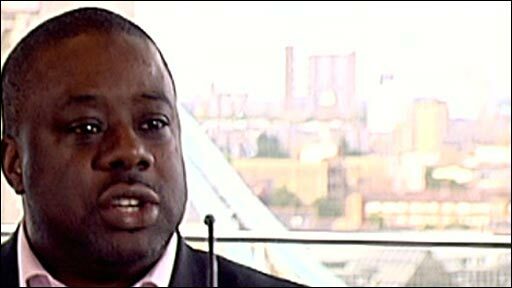 London's deputy mayor has resigned two months into his post amid claims of financial irregularities. Ray Lewis faced allegations relating to his time as a vicar in east London in the late 1990s and head of a youth academy scheme in 2003. He was placed under Church of England disciplinary measures in 1999. London Mayor Boris Johnson said he was sad at the resignation - but insisted he would re-appoint Mr Lewis if he cleared his name. Mr Lewis, who had special responsibility for youth, described the claims as groundless and rubbish. He had been appointed as one of Mr Johnson's several deputy mayors with specific portfolios. Mr Lewis said: "I cannot allow the things going on around me to obscure the important business of this very important mayoralty and for that reason I must step down with immediate affect. "London faces enormous challenges and I believed in all my heart that I was best placed to do that, but it's important to get on with the business of this mayoralty without this business hanging over Boris' head. "Yet today again we learn of another murder and yet so much time and attention's been given over to something that may or may not have happened 10-12 years ago, and of course you know that I flatly deny it." Mr Lewis resigned the same day Mr Johnson formally opened an independent inquiry into the allegations. Mr Johnson said he was sad at the resignation but added: "The reason I hired Ray Lewis is that we won't solve the problems of this city if we rely on anti-septic yes men. "He has a god-given power and ability to inspire young people and to divert them from catastrophic mistakes of guns and knives and I very much hope that he'll now be left alone to clear his name and get on with what he does so well." He added: "If Ray Lewis cleared his name then of course I would re-appoint him." Martin Narey, the former chief of the Prison and Probation Service, will be heading the investigation into Mr Lewis. The deputy mayor faced multiple claims, including one which centred on allegations he was entrusted with £25,000 from a woman in the congregation in the Parish of St Matthew, West Ham. Mr Lewis was placed on the Church of England's Lambeth and Bishopthorpe Register - the so-called Lambeth List - in 1999. People on the list are prevented from public ministry and preaching. Mr Lewis' resignation is the second to damage Mr Johnson's team since he became mayor in May. Last month, James McGrath, stepped down as director of political strategy at City Hall. London Assembly member Murad Quereshi said: "We have already lost one senior advisor and now we have lost Ray Lewis who was spearheading perhaps the most important policy in the whole administration, an attempt to reduce youth crime. "It just makes you wonder what the future holds for this administration."